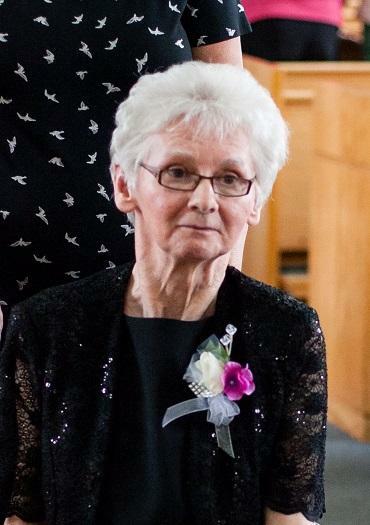 Passed peacefully away, in the presence of her loving family, on Saturday, May 26, 2018 at the Blue Crest Interfaith Home in Grand Bank, JOAN DEANNE HODDER, of Creston South in her 71st year. Leaving to mourn, with many cherished memories, are her husband Jim of 51 years at Blue Crest; children Judy Hillier (Roy) of Winterland, Janice Bolt (Rick) of Rothesay, NB and Jeff (Michelle) of Creston; Grandchildren Robyn, Kirby, Jordan, Devin, Hayden and Haley; Great grandchild Jordan; Sister Holly Ferguson (Ken) of Whitby, ON; brothers Captain Randy Kirby (Diane) of Seal Cove, FB and Melvin Kirby (Madeline) of Burin, brother-in-law Cyril Green of Lewin’s Cove, Aunt Sheila Grant and Uncle Al of Halifax; and a large circle of other family and friends. Joan is predeceased by her parents Leonard and Lillian Kirby and sister Yvonne Green. Lieutenant Daniel Kelly conducted the Funeral Service at the Salvation Army Faith and Hope Corps, Creston South, on Wednesday, May 30th, 2018; at 2:00 pm. Interment was at the Salvation Army Cemetery in Creston South, NL. Donations in Joan’s memory may be made to the Blue Crest Resident Bus Campaign or the Salvation Army Cemetery Fund. Pall bearers were Devin Bolt, Melvin Kirby, Jordan Bolt, Cyril Green, Rick Bolt, and Roy Hillier.